As a child, every fall, I looked forward to doing this autumn craft with my mom. We'd gather the prettiest fall leaves and press them with a hot iron between pieces of wax paper. We used the leaves to create fall and Thanksgiving craft projects throughout the entire season. The pressed leaves won't last forever, but they will last several months, and these Pressed Fall Leaf Placemats make a wonderful addition to your Thanksgiving table. Step 1: Take a walk through the woods, or through your back yard with your family and pick out all your favorite fall leaves. Step 2: Lay a towel out on your ironing board, then, lay one piece of the 12 x 18 inch wax paper on top of the towel. Step 3: If you have a die-cut machine, cut out the letters for Happy Thanksgiving (or any othe rmessage your want to feature), making each letter about 1½ inches tall. 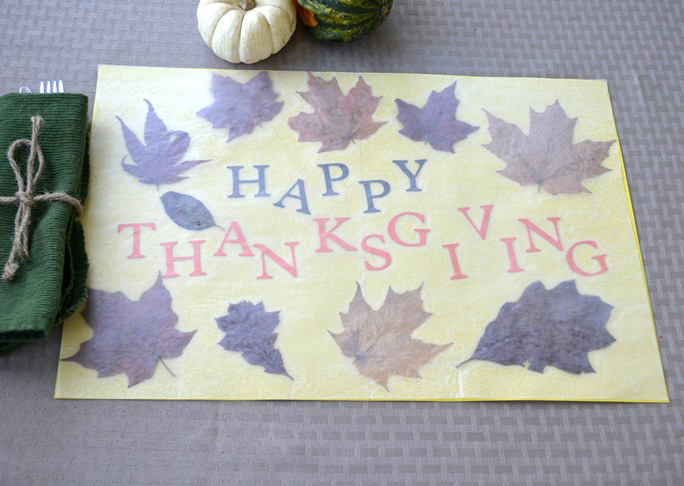 If you don't have a die-cut machine, use stencils and cut the letters by hand, use die cut sticker letters, or have your child write out Happy Thanksgiving on a strip of construction paper and add that to your place mat. Step 4: Select your favorite leaves and arrange them on the wax paper around the spelled out Happy Thanksgiving. Step 5: Carefully place the second piece of 12 x 18 waxed paper over the top of the leaves and letters. Step 6: Top the placemat with a second towel so the place mat is sandwiched between two towels. . Step 7: Heat your iron to the highest setting. Step 8: Once the iron is heated, slowly run it over the top of the towel. Run it slowly over the towel several times to make sure you get every corner pressed and heated. Step 9: Remove the top towel, The 2 sheets of wax paper should have sealed around the letters and the leaves. Step 10: Slide the sheet of 12 x 18 inch construction paper under the pressed leaf place mat. This will really bring out the colors of the leaves. Step 11: Use your place mats to set a festive fall table on Thanksgiving Day. The wax paper gives the place mat a frosted glass look. 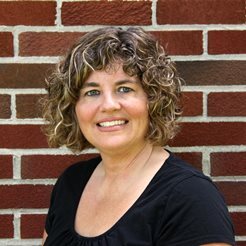 Linette Gerlach has lived in Ohio all her life; she graduated from Wright State University with a degree in Operations Management. She worked in the corporate world for over 10 years before she decided it just wasn’t her thing! She’s been a freelance writer, blogger, and amateur photographer for over 6 years, and she is deeply passionate about creating fun food, crafts, and DIY projects. Her blog, The Kid’s Fun Review, is an online magazine that features fun and creative content for kids and their families. She enjoys interacting on social media, so you can find her on Twitter or Pinterest at linetteg and on Instagram and YouTube at linetteg1.